When Alex Elman was diagnosed with juvenile diabetes at age 9, the doctors warned she might lose her eyesight. "Truth be told, it was something I was terrified of," Elman said. "But when you're a kid, you feel invincible and think that stuff isn't going to happen." Unfortunately, it did. At 26, Elman had to undergo numerous eye operations. The doctor told her that her sixth operation would determine what she could see. When she opened her eyes, Elman said, "it was like looking at blackness in a crack." According to Elman, one thing was more terrifying than that initial blackness: "total loss of independence. Having to count on people to get around was the worst thing ever." Yet Elman has gone on to achieve more independence than most, as an entrepreneur. She went from trading rare and fine wines for her stepfather to starting her own wine import business, Marble Hill Cellars, in 2002. 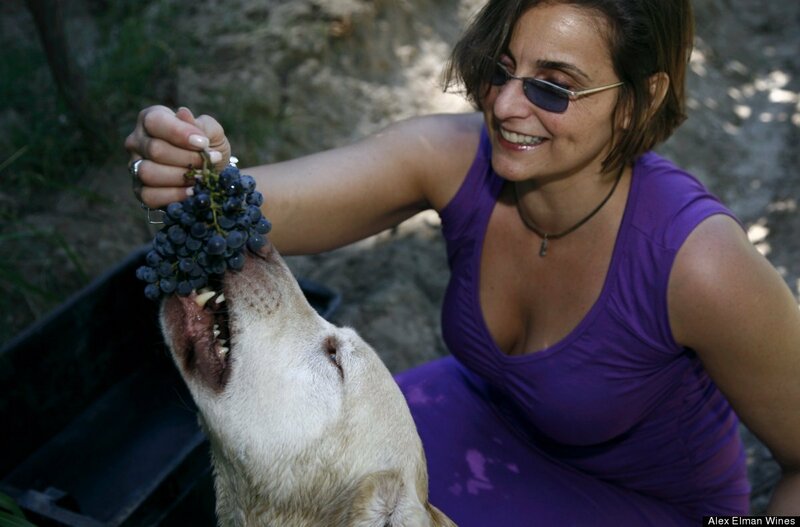 Most recently, she launched Alex Elman Wines, a lifestyle brand of wines and food products that "are honest and authentic," she said. "There has been so much manipulation of foods and wines, I would love to bring it back down to earth." Elman said her blindness hasn't hindered her as an entrepreneur; rather, it has helped her hone her ability to discern wines and people. HuffPost Small Business recently asked Elman what losing her sight taught her about running a million-dollar business. Can you describe what it was like to start losing your eyesight? I was sitting at my desk, looking at wine, and it looked fuzzy, so I closed my left eye and everything was fine. I closed my right eye and it was like I was looking through a cotton ball. I totally freaked out. My capillaries were bleeding, which you couldn't see on the outside but the inside of my eye was filled with blood, making it hard to see. They were trying to save my eyes, but the diabetes itself wasn't getting under control fast enough. What was your reaction when you realized you had lost your sight completely? I was always very active and did photography for fun, so in a way, it was hard, but in another way, it was a relief, because I kept having surgeries and putting everything on hold. At least at this point, I knew this was it. I had to mourn the end of one way of life and begin to accept a new reality. Even though I'm a strong person, it was not an easy period. There were very dark days. I remember the first time I went to wrap a Christmas present and couldn't find the line to put the paper on and started crying. I had to deal with the psychological crap, but it allowed me to get to know who I was and where my strength was from, and I knew I was never going to let something like this stop me. How did your loss of sight affect your palate? I was already trained classically, but it allowed me to concentrate completely on the smell and taste and not let other things distract me. I was able to hone not only my palate but my practice. I looked at it as a gift. This is a great business to be in [without sight], because the most important thing is your nose. I felt like people were making wines for certain palates as opposed to making wines that are correct. With my stepfather's blessing, I left and started a business that imported handcrafted wines until 2008, when the economy collapsed and the wine business took a dive. At that point, I started talking to a beer distributor who wanted to start a label with my name on the wine. We wanted the American public to know what wine is supposed to taste like. It's hard enough to start a business -- did you feel it was harder not being able to see? Half the time I forget I can't see, which is problematic, trust me. But I never thought about the pitfalls. I knew my palate and my nose would get me through it. I also knew that I could not run a wine import business alone, nor did I want to. Life isn't about being solitary. We are inter-dependent. Going blind taught me that, and I was able to translate that into my business. Another thing is [losing my sight] allowed my sense, my intuition, to really come through. I can sniff people out, believe it or not, and can tell if they're good people or not. My eye doctor said people would try to take advantage of me, but that hasn't been true. Do you feel losing your sight happened for a reason? I do believe that. This was never a business I planned to be in, but someone was planning something for me. I've heard the three things Americans are most afraid of are cancer, heart attacks and losing your sight. And I show people it's really not that bad. You can make something out of nothing. Things happen to us and we just have to go with it. We have to adapt and prevail. Elman's seeing eye dog, Hanley, changed her life. "As soon as got my dog, it was awesome. I could travel, I could walk fast, I could go all over world again by myself with my dog," she said.